Hoo-Ha! I did it again! Wow, bungee jumping is something I thought I would never ever do in my life, let alone doing it the second time. But hey it happened. 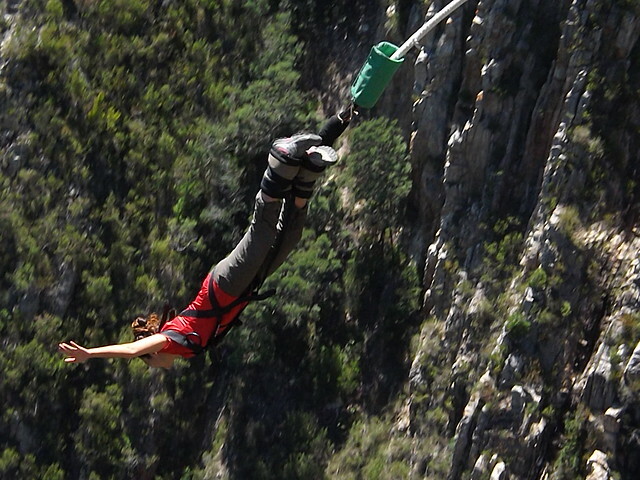 I did bungee jumping South Africa! I planned for many crazy stunts going to South Africa: cage shark diving, sky diving, riding an ostrich, getting drunk in the wine region, going to Malaria infested Kruger Park, but bungee jumping, no thanks. I already did bungee jumping in Costa Rica. And I had a video to prove it. Go watch the video, you’ll see I was terrified to tears. It took me 4 minutes before I finally took the leap. Sure my bridge in Costa Rica was only 80m high, but it’s all the same. It’s not the height, it’s that instant you had to jump that chokes you. And of course the hours (or days) that lead to that moment. But the advert and brochures for Face Adrenalin’s World’s Highest Bungy Bridge is everywhere. I mean it literally. You see them in the Bazbus, in all the hostels, in the travelers’ guide book Coast-to-Coast and Alternative Route. And travelers you meet either did it or did not, will do it or will not. I mean everyone talks about bungee jumping in South Africa. This one in particular because there are actually several places to jump in this route. I scheduled for a morning jump because I didn’t wanna spend the whole day thinking about the jump. Sure it had been on my mind since I scheduled the jump but you don’t actually feel the stress until the minute you wake up the day of the jump. I arrived Rocky Road Backpackers in the Crags the day before (one of the nicest place you can be in, and totally recommendable), spent a really nice evening with the other travelers staying there and the awesome staff. I talked about doing the jump the next day and surprisingly feeling quite calm. But I didn’t finish my wine, so that was strange. 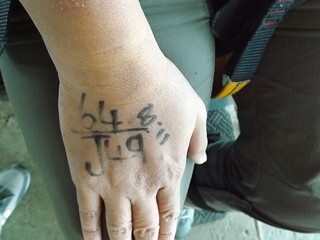 It starts at the registration where you sign a waiver, get weigh in, and assigned a jump number. In this case I’m jumper #49 at 10:00. My jump is at 11:00am. And unfortunately 64 is my weight in kg. Then you get sent to the Harness Area where you are to be fitted with a guess what? body harness where later a bunch of cables and clip hooks will be attached. 10 at a time are grouped together and assigned to a guide who will explain everything–about the bridge, the safety procedures, and then lead you about 300m walk to the center of the bridge, just below the highway, where the moment of truth shall take place. This is no ordinary walk, I tell you. You walked on a skinny bridge way that is mesh like, so if you looked down, you know exactly what you fall into. And I have never had a better posture in my life. I looked straight ahead the whole time for fear of backing out. I noted that I didn’t have the heavy heart pounding that I experienced in Costa Rica, but it was far from confident. Finally you end up in the platform where the jumps take place. The mood was quite nice with DJ playing upbeat music you can’t help but move with the rhythm. One by one the jumpers were sent off the bridge. There’s a camera in front of the jumper and a TV screen where you see them. It was interesting to watch different reactions. inhale deeply, this is it! Congratulations, I did it again. As you see, there weren’t drama like the last time. Not because I’m excited or more confident but because there were people waiting in line and I will be too embarrassed to make a scene and so I jumped at the count of 3. Ha ha ha. Here is a video taken by Face Adrenalin. The video quality is not that good but the filming is amazing. Feel what I felt as it happens. I still get sweaty palms at the instant before the jump. After coming up, one of the boy told me, you are always looking at the camera. Ha ha. I’m not super vain. The only reason I was looking at the camera the whole time was because I refused to look down and because the dome camera is in front of me, it seemed that I’m constantly checking myself out. That is why! So what went on in my mind this time? Actually not a whole lot. This time I had my eyes open and was able to enjoy the view, albeit for 4 seconds only. The falling experience is that same. You don’t get the hole in the stomach feel during the first fall but on the 2nd and 3rd fall. This jump I did was with the company called Face Adrenalin. I have to commend that they were really professional. They have a process that is very systematic. They also call out each process like singing a song which is great because this is an added assurance that they will not forget any procedure. You will go through several checks by several staff. It actually work like a factory assembly line, them sending people off the bridge. I felt very safe. If you are in South Africa now and contemplating of doing a bungee jump? You have to do it with Face Adrenalin. Beside being real safe and professional, you want to jump off the highest possible ledge! So how much is bungee jumping with Face Adrenalin? Jumping with Face Adrenalin costs ZAR 790 (USD79) per jump and the complete set of photo and video is ZAR 250 (USD25). There is a discount for 2nd jump. You go girl!!!!!!!!!! I did it in Macau, not sure I would do it again. You did it again! Congrats lil!